shouts of excited peasants and the many other noises inseparable from an Irish market. The enormous variety of things offered for sale was really astonishing, and as the road was almost blocked with stalls we had to wheel our machines out of the town. Soon after leaving Macroom we got into undulating country before reaching the river Loo. We decided not to go to Killarney as we had visited the lakes a few years ago so we turned south-west to Kenmare. Here we pulled up at the large store of “ Denis O’Brien Corkery and Co “ for petrol before proceeding along the road skirting the beautiful Kenmare river. The purple hills in the distance and the blue water in the foreground made a lovely panorama as we rode along. We stopped at Blackwater Bridge, as we had been told beforehand of this exquisite spot, with its little bridge spanning the deep narrow gorge and the river rushing over its rocky bed far below. The Kerry roads were a vast improvement and left little to be desire except for the large number of loose stones, kept our eyes more on the road than the lovely views warranted. The cattle and horses we met on the road were so unused to motorcycles that we frequently had to dismount to let them pass whilst the dogs were truly awful in their efforts to outdistance us, one keeping up with us literally for miles. It was only by going “ all out “ that we eventually shook him off!. We found it a most useful plan to keep a stock of stones in the pockets of our dust coats, and to discourage the ferocity of these animals with a few well-aimed shots. The machines had run all the way without a hitch, except for tyre troubles; our spare belts had not been touched, and our oilskins had not been requisitioned as the weather looked like continuing fine. Our destination, reached that afternoon, is 484 miles by road from London, and we felt well satisfied with the success of our outward journey, but decided that the shaking up between Cork and Wexford was too much to face again on our return. The little hotel in Derrynane was full up, so we inquired at the post office at Cahirdaniel, two miles distant, where we could put up, and were surprised and glad to find that they could accommodate us there. We were rather afraid we should have to stay at Waterville, eight miles off, as Cahirdaniel is a tiny place and Derrynane merely consists of Derrynane House, where lived the great Daniel O’Connell and where his descendants have since dwelt. We spent a delightful week here (18 miles from the nearest railway station, Cahirciveen), amidst some of the finest scenery we have seen, not new to us, as we had occupied the small house in this district nine years ago. This week, spent as it was in bathing, walking, revisiting old friends and haunts, and a little motorcycling, was soon over, one of our excursions being to Parksanilla. There is a large hotel hear, which is visited by many who know the charm of its surroundings. Motorcycles were not unknown in Cahirdaniel, as we found a 3h.p. Triumph cylinder and some empty petrol cans in the very shed where we stored our trusty singles. However horses met on the road were sufficiently unused to them to shy in a most disagreeable manner; so much so that on one occasion one of them drawing a cart-load of timber, left no more than 18 in. or so between it and a stone wall for H. to get through. The cart was successfully avoided, but the footboard and spare tin of petrol were crumpled up beyond recognition against the wall. I also did not escape accident entirely, for, just as we were leaving Cahirdaniel at the end of our weekm, and had ridden a few yards along a narrow winding road, the postman’s cart suddenly came into view, and although going at a very moderate pace, I could not altogether escape it, and crashed into the wheel, sending the machine sprawling over me. 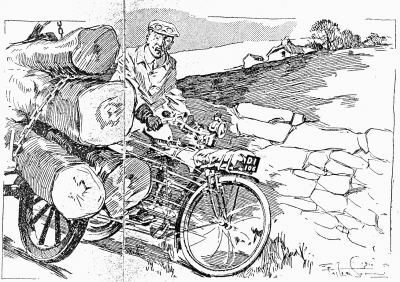 H. rode up, and together we picked up the Triumph, expecting of course to find it in an unrideable condition, but instead it was practically undamaged, while a very painful knee showed where the cart and I had met. In spite of this we managed the 90 mile journey into Cork. Where I was to leave H. to stay with friends, and proceed alone. However the doctor recommended a few days rest, but I found the knee more comfortable after 36 hours in bed, so as planned, I caught the morning boat train to Rosslare, and crossed from there to Fishguard, riding the 15 miles to Havorfordwest that evening. The good weather that had accompanied us from the start of the holiday forsook me during the next day’s run of 127 miles to Mitcheldean, and the heavy rain made me long for chain drive ( which I enjoy on my 1910 machine) to replace my sadly slipping belt, which forced me to pedal lustily on all but ordinary gradients. I put up in Mitcheldean at the George Hotel, one of the most curious buildings of its kind I have ever seen, for its design is quite unique. The proprietor informed me that it was formerly a pin factory. It was incidentally the cheapest place at which I had put up during the whole tour. The next day’s run home, 126 miles, nearly three weeks after we had started, was uneventful, except for serious tyre trouble at Stroud, where I put my spare Rich tube into the back wheel, the other tube (endless) being so damaged that I cut it out with scissors, and was very thankful that I had kept the Rich in reserve until now. H., three weeks later, had an enjoyable and absolutely uneventful ride home over the same roads. We both agreed that we had one of the best of summer holidays, and were delighted with the way the machines had carried us for the 950 miles. One little accessory we carried was particularly useful in Wales and Ireland, viz., a small fine-gauze petrol funnel. To any motorcyclists contemplating a visit to Ireland, we can thoroughly recommend the route we took as far as Fishguard, and the treatment the machines receive on the G.W.R boats; but we do not advise riding from Rosslare westwards as far as Cork. There is also the direct Fishguard and Cork boat; this H. found very comfortable on his return journey.